United Airlines and All Nippon Airways are showing open jaw flights where you fly from Montreal to the Philippines - and then home from Singapore - for $537 to $606 CAD including taxes. The flight between Singapore and Manila is not included. 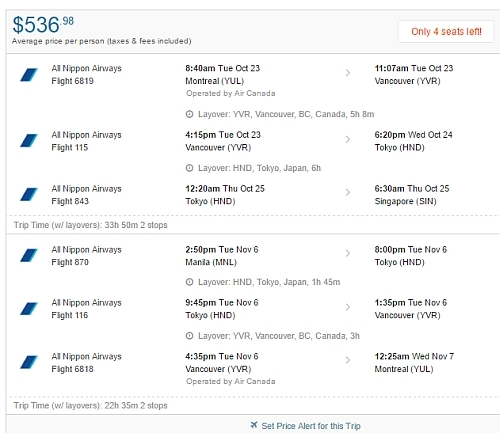 A one way flight from Singapore to Manila generally costs around $55 CAD on airlines like JetStar. NOTE: With the flights where you fly into Manila first, and then home from Singapore, a lot of them have a 21 hour layover in Los Angeles on the way home (which may be a bonus if you have any interest in checking out Los Angeles for a day). But if you try the same dates, and switch the destinations around (fly into Singapore first, and then home from Manila) - it may get rid of this 21 hour layover. You can also try other Monday, Tuesday, Wednesday, and Thursday dates in and around the same dates as below. montreal, yul, flight deals, asia, southeast asia, manila, philippines, mnl, united airlines, singapore, ana, all nippon airways and sin.